Takayama's TOMMY WITT model longboard. Deep Turquoise tint on bottom and rails, clear deck inlay in a gloss & polish finish. Full body black pinlines around the deck inlay. Lo-profile black Takayama Ocean Tern logos. Single 5/16" Redwood stringer. Nice forward swept tail patch. Single center fin box with Takayama fin included. Length: 9' 2" Width: 22 3/4" Thick: 3"
Nose: 17 1/8" Tail: 16 1/8"
Tommy Witt designed this user friendly log that can handle steep noseride sections in the pocket but not too bulky in the nose for maneuverability off the tail. Can handle a variety of conditions from beach breaks to point breaks. 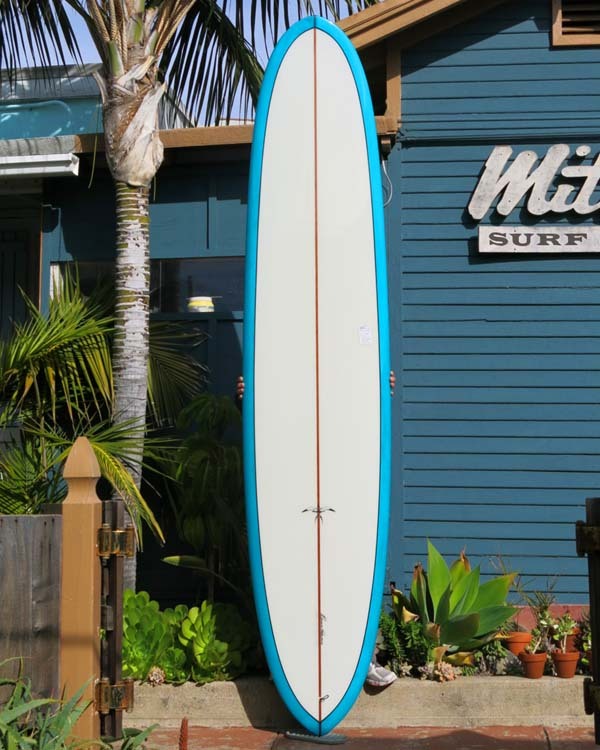 Excellent single fin log that works like a one board quiver. Hand shaped and glassed polyurethane foam. Made by Hawaiian Pro Designs in Oceanside USA. Shipping cost additional. Check our Shipping Info. IN STOCK NOW at our SOLANA BEACH shop.